There used to be this show on Food Network, “The Best Thing I Ever Ate”. Locally, I used to think that the now defunct Mesa outlet of Caffe Boa Bistro (when Chef Payton Curry was there) made the best thing I ever ate.. the Pork Agrodolce. This dish, while by no means healthy, absolutely blew me away. What is it about deep fried food?… that crispy outside and gooey interior warms you all over. The pork agrodolce was deep fried crispy bacon lardons tossed in sea salt and parsley, served with a sweet-sour asian dipping sauce. They were amazing. I’d forgot all about them until we decided to make our own tator tots. These Flavor Tots left me with the same, ‘OMG’ sensation. They were crunchy, gooey, and absolutely yummy! We basically made very flavorful adulterated mashed potatoes… with your typical boiled mashed Idaho’s (put through a ricer). We added whipped cream, butter, salt, munster cheese, roasted garlic, cooked chopped bacon, and a little flour. Adjust until awesome. Then I kneaded them every so slightly, just to get into a ball of ‘dough’, then rolled them into long ‘ropes’. I cut them individually and laid them out on a cookie sheet lined with wax paper. I put the cookie sheets in the freezer. At dinner time, I set out 3 pie plates: one with egg wash, the second with panko (bread crumbs), and the third with flour… each seasoned. I rolled the frozen tots in flour first, then egg wash, back in flour, egg wash, then panko… and fried until deep golden brown (you want to make sure they are warm all the way through. Taste them to check making sure seasonings and cooking times are right. 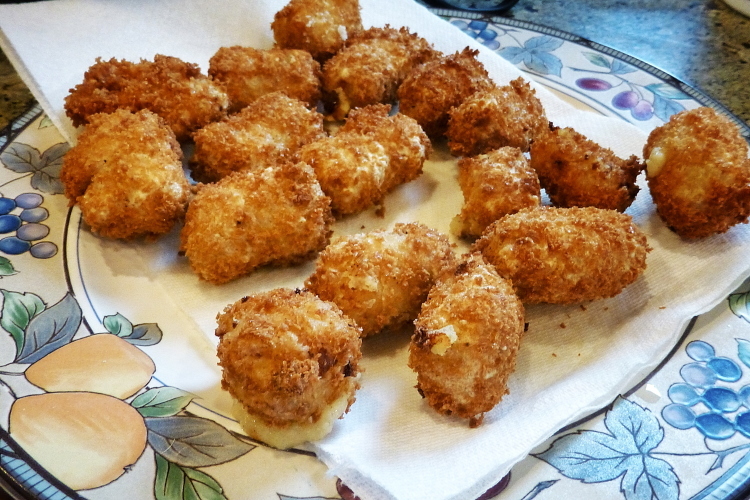 Wow… they blow away the store bought tator tots with their gooey flavorful filling. Amazing! This entry was posted in What's For Dinner and tagged caffe boa, flavor tots, tator tots, tots on May 9, 2015 by kritterspaw.